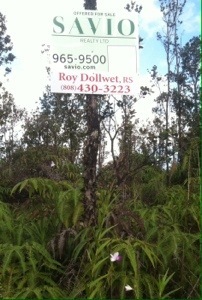 Directly across the road from us is 3 acres of land for sale! Wouldn’t you like to be our neighbors?!?! 🙂 If you are interested, give them a call! The land is on road 6, in Hawaiian Acres, just down from F towards G.
The Hawaiian name for Road 6 is the same as the rough lava, O`oa`a , pronounced Oh-oh! Ah-ah!, probably because that is what you would sound like if you tried to walk on the rough and very porous lava. Funny enough, Hawaiian Acres has very little O`oa`a lava. We have plenty of Pahoehoe lava. 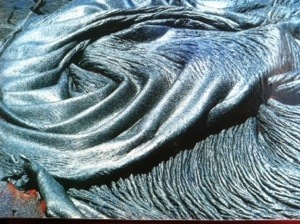 Pahoehoe is MUCH more solid, and sometimes looks very ropy, like a lot of ropes squeezed up together.